This colorful New York themed gift box, featuring photo's of NY hot spots, arrives generously filled with tasty snacks and New York Blend premium coffee! What a great tribute to NY! Don't waste anymore time looking for the perfect New York gift basket. You've just found it. Our unique NYC gift basket will surprise and delight for any occasion. 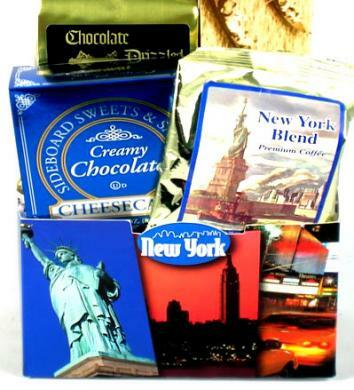 This colorful New York themed gift box, featuring photo's of NY hot spots, arrives filled with Roasted Garlic and Herb Crackers, Tomato Basil Cheese, Chocolate Drizzled Popcorn, Rum Cake, and ìNew York Blendî premium coffee!